Bridgestone has a wide variety of tires to meet your performance needs, no matter what you drive. 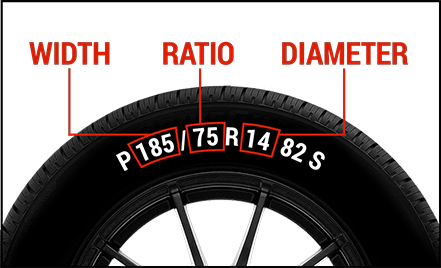 Get started by selecting your wheel size below to find the right Bridgestone tire for your vehicle. Finding the perfect tire for your car, truck or SUV is as easy as selecting your tire size. Your size can be found in a few locations: on the inside frame of the driver's side door, inside the glove box door, your driver's manual or your tire's sidewall. If you’re unsure of how to read your tire measurements, check out this article to walk through the steps. Tire sizes are comprised of a few key sections organized in a uniform manner. The first letters, either "P" or "LT", stand for passenger or light truck. Following that, the first number represents the width of the tire and the second is the aspect ratio, or your tire height in relation to the width. This is followed by a letter that indicates the construction of your tire, and then lastly, the rim size, or your wheel diameter. Once you have this information, you can select the right wheel diameter for your vehicle and quickly find the tire that best suits your needs.